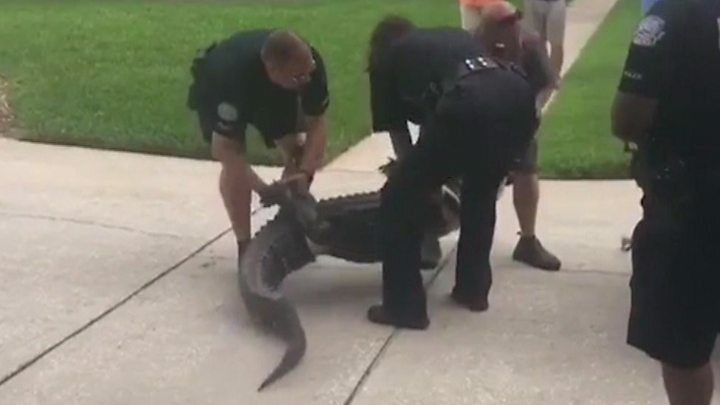 A dog-walker in the US state of Florida has gone missing, and she was attacked by an alligator, a witness told police.The 911 caller said the reptile dragged the woman into a lake at 09:45 on Friday (13:45 GMT) in the town of Davie, 25 miles (40km) north of Miami.Local media report officers found a dog on a leash but no signs of the woman at Silver Lakes Rotary Nature Park.State wildlife officials are now hunting for the alligator. The woman has yet to be identified. "Divers are searching," Davie Police Maj Dale Engle was quoted as saying by the Sun Sentinel newspaper. "Her dogs won't leave the pond. One of her dogs got bit by the gator." Neighbours told local media that they have seen children swimming in the lakes.Edwin Gomez, a regular visitor to the the park, told CBS News: "I saw the gator yesterday, it responds in a natural way. "It's sad to hear someone got hit by the gator. "The reptiles are "opportunistic feeders" that live in all of the state's 67 counties, according to Florida Fish & Wildlife Conservation Commission website.It is not uncommon for alligators to be removed from householders' swimming pools, but their attacks on people are rare.Despite the reptiles' widespread presence, only 22 people have died in alligator attacks in Florida since 1948.